EUREGHA has officially signed the Cohesion Alliance declaration in order to advocate for a stronger Cohesion policy after 2020. 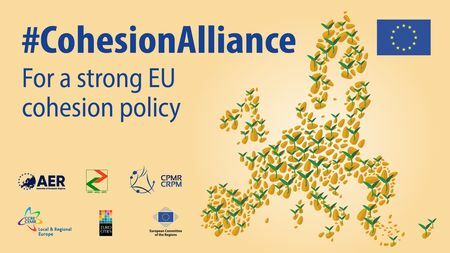 The #CohesionAlliance is a coalition of those who believe that the EU Cohesion policy must continue to be a pillar of the EU’s future, as it is a major driver of job creation, sustainable growth and innovation in Europe’s diverse regions. The Alliance was created through cooperation between the leading European associations of cities and regions and the European Committee of the Regions. It demands that the future EU budget makes the Cohesion policy stronger, more effective, visible and available for every region in the European Union, as “undermining the Cohesion policy risks undermining Europe’s future”. EUREGHA strongly believes that the next Multiannual Financial Framework should reflect the strong role that European regions and local authorities have in conceiving and implementing policies for European citizens. Investing in tangible and intangible assets and ambitious programmes for jobs and growth cannot be done without a strong Cohesion budget. Not only is the Cohesion policy the main EU investment tool, but it is also a means to ensure a European perspective to all the actions that we implement in our territories. By signing the Cohesion Alliance declaration, EUREGHA is the first network representing the public health sector to send a strong signal to the Leaders of Europe on the future of the EU budget.